Look out! Here comes one of the biggest animals on Earth! It’s getting a close-up look at you, as you take a close-up look at it. Everything about a sperm whale (left) is BIG. Its body can be as long as two school buses. Its dives are some of the deepest made by any animal. And then there’s that giant snout. It takes up so much of the whale’s head, you might say the head is all nose! But as big as a sperm whale is, the ocean is way bigger. So for scientists trying to study sperm whales, just finding them is a challenge. Sperm whales spend most of their time in the ocean depths. They go there to hunt for deep-water squid, their favorite prey. The whales spend only a small amount of time near the surface. And that’s when scientists have been best able to study them. But there’s still a lot that scientists don’t know. So everything we learn about these giants is BIG news! Read on to learn some big things about these big guys. Like playful puppies, these family members like to rub and roll against each other. These big whales do a lot of “talking.” They do it by making clicking sounds in patterns called codas (KOH-duhs). Different groups of whales use different codas to talk, and young whales learn the sounds from older ones. Codas may be a way for the whales to identify themselves to each other—kind of like name­tags that can be heard instead of seen. That’s helpful in the deep, dark waters where the whales spend so much time. Besides being talkative, the sperm whales in a family group can also be very touchy-feely. You might not think of such gigantic animals as being “snuggly,” but sperm whales do like to rub up against each other. They even roll on top of one another’s bodies. The clicks sperm whales use to talk to each other are softer and slower than the other clicks the whales make. The whales use other clicks to find food and investigate their surroundings. This is called echolocation. 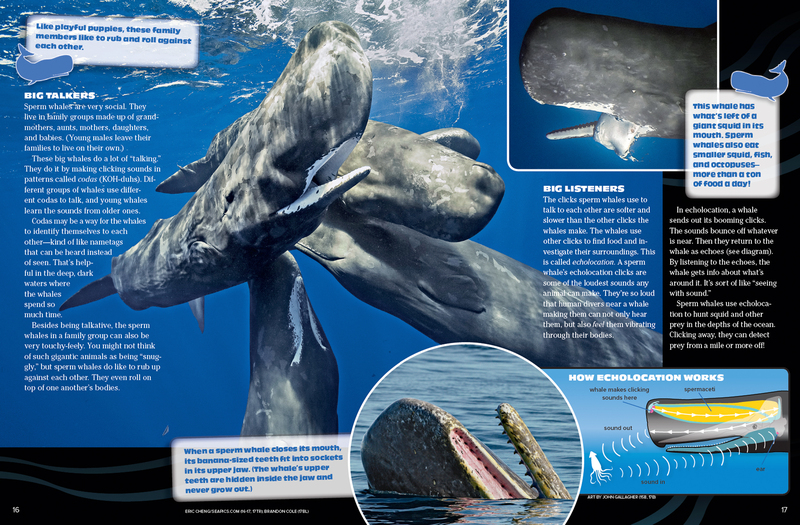 A sperm whale’s echolocation clicks are some of the loudest sounds any animal can make. They’re so loud that human divers near a whale making them can not only hear them, but also feel them vibrating through their bodies. Sperm whales use echolocation to hunt squid and other prey in the depths of the ocean. Clicking away, they can detect prey from a mile or more off! This whale has what’s left of a giant squid in its mouth. Sperm whales also eat smaller squid, fish, and octopuses—more than a ton of food a day! That whale of a nose is the first thing you might notice about a sperm whale. Much of the nose is filled with waxy oil called spermaceti (spur-muh-SEH-tee). Most scientists believe that the spermaceti helps the whale with making sounds for echolocation. People continued hunting the whales for decades. Finally, in the 1980s, it became illegal. Today, scientists think there may be around 360,000 sperm whales, but no one knows for sure. 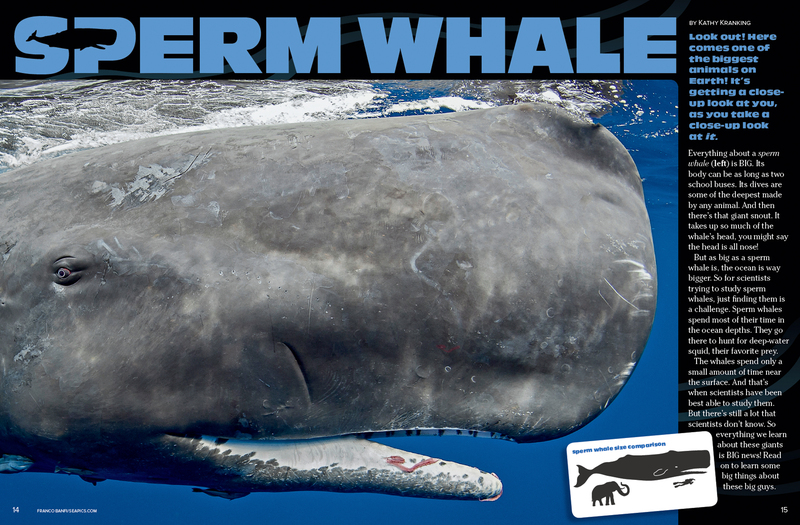 You probably won’t be surprised to learn that sperm whales have really big babies. A newborn sperm whale weighs about a ton! It drinks thick, cottage cheese-like milk from its mom. A baby will nurse for years, even after it begins eating solid food. Though a baby sperm whale sticks close to its mom a lot of the time, other members of the pod help care for it, too. For example, when its mom has to dive deep for food, other whales “babysit,” sometimes even nursing the baby. A mother sperm whale almost always gives birth to just one calf at a time. A sperm whale breathes through a blowhole. The hole is slightly to the left side of its head. When the whale breathes out, spray shoots from the blowhole at an angle—not straight up as in most other whales. Though hunting isn’t allowed any more, sperm whales still face some problems. For example, they sometimes collide with ships or get tangled in fishing nets. And they can swallow plastic and other ocean trash, which can make them sick or even kill them. But people are working to help sperm whales in different ways, such as by trying to pass laws that ban large fishing nets. And they keep trying to learn everything they can about sperm whales. They want to be sure these amazing animals can swim safely in the world’s waters forever. Going down! The tail is the last thing to disappear as a sperm whale heads down for a deep dive. Sperm whales can hold their breath for more than an hour. 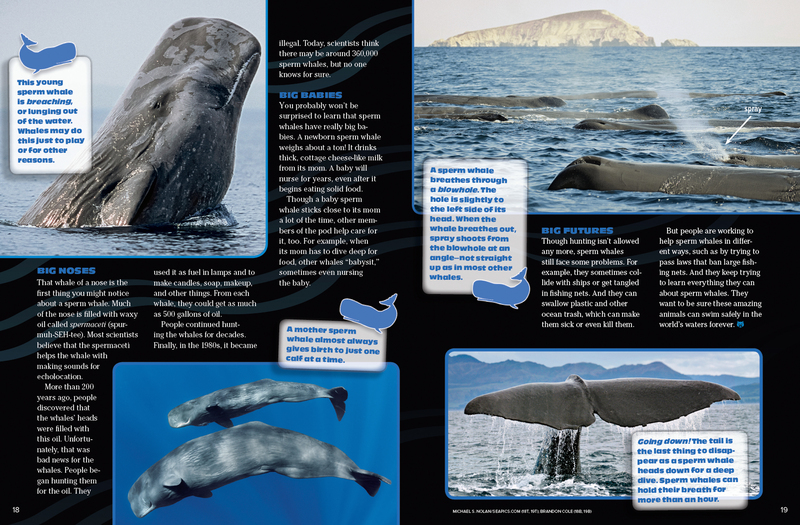 “Sperm Whales” originally appeared in the November 2016 issue of Ranger Rick magazine.